I, Laura Bell, am an Instagram addict, and I’m totally ok with admitting that! For me, I use it as a tool to draw inspiration from people I look up to, including hairstylists, make up artists, fashionistas and bloggers. I pick up fashion tips daily from @emmahill. Whilst @emmachenartistry is my go to girl for all things make up. If I’m unsure how to style my hair, a quick flick through @beyondtheponytail gives me enough inspo for a months worth of textured up-do’s. My camera roll is one big album filled with screen shots of images I have fallen in love with, to the point I’ve now made folders. So when I need to find that colour formulation I screen shot 2 weeks ago, I can find it quickly in my ‘hair’ folder. Below are some of the accounts that inspire me daily and the reasons they’re at the top of my search list. Emma was always going to be my first! Do you know, I think we’d made good friends. (too weird?!) Emma’s Instastories have me in hysterics daily, her blazer collection is beyond anything you’ve ever seen and her jewellery collection - my word! Emma’s blogs are honest and current. I love following Emma and her Husband Simon on their daily adventures. She makes me laugh out loud and her vlogs definately make my 3am night feeds a little more bearable! Audrey’s cool. Too cool. Just looking at her golden insta feed takes me to sunnier climates. High street fashion teamed with vintage designer and the perfect golden tan - perfection. Audrey recently uploaded a photo wearing a one shoulder black swimsuit from primark. It took me straight to Oxford Street in search. You’ll be glad to know, I found it! I give you the best in the business from down under! Emma Chen. 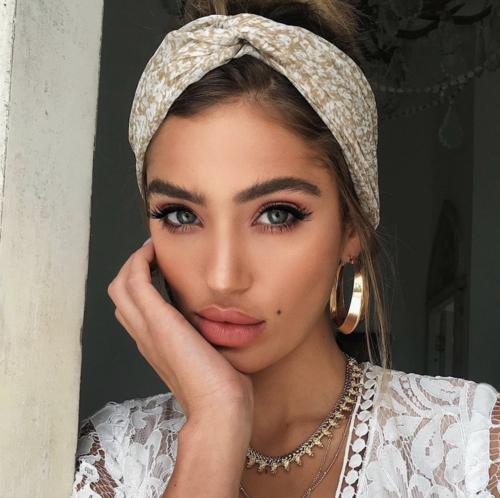 Emma’s feed is filled with texture on top of texture on top of beautiful head scarfs and the most beautifully bronzed faces. Emma was the reason I ditched the perfect curl and now opt for textured beach waves. I no longer feel bad for using a whole can of Moroccanoil dry texture spray in 4 weeks. If I ever go to Aus, I will 100% be signing up to one of her classes. Check back next week for an interview with Emma Chen! If you’ve read my post on olaplex, you’ll know I keep a bottle close for when colouring hair. I personally treat my hair with olaplex weekly, and with a 1.2m following - olaplex are clearly doing something right. @olaplex is the feed to visit for hair colour inspiration. They share the most amazing transformations from stylists worldwide, therefore pointing me in the direction of the best colourists from around the world. I have learnt new colouring tips and tricks, amazing formulations and more in-depth science behind the colouring process. Not just for the hair professional, a great account for hair inspiration. Founded by @angelacattanaehair, this amazing collection of photos showcase the work of some of the best hair artists from around the world. My first Instagram search if I’m needing some styling inspirations. A great account featuring knots, braids and festival hair. My hair accessories collection has quadrupled since following this account. If these accounts are new to you, I hope they bring you lots of fashion, make up and hair happiness. I’d love to know the Instagram accounts that inspire you and why. Let me know if there are any hidden gems you think I’d love to follow!